It's been a busy month! Swimming, visiting family in Indiana, and just enjoying the summer! So here I am back at it! So, a gluten-free multi-vitamin, who knew it would be so hard to find! I originally went with Flintstones Complete. Unfortunately, Flintstones cannot guarantee their product 100% gluten-free "due to the fact that raw materials they receive from outside vendors are not certified as 100% gluten-free." So needless to say, I'll be taking my Flintstone vitamin everyday (my favorite color is purple). 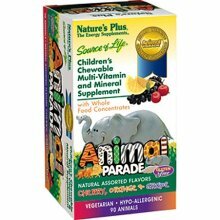 Nature's Plus Animal Parade Multi-vitamin Chewable! There's no doubt that this vitamin is essential for Jack's growth. I know he's not getting all the vitimans and nutrients that he needs due to his picky eating habits, but I'm happy to report, he tried carrots last night as well as ham! Yes, I use a bribing technique, but it works - what kid doesn't love special treats! His new favorite treat, Fruity Pebbles Treat or Cocoa Pebbles Treat. Whatever it takes to get my little guy his vitamins and nutrients, right? Happy, Healthy Boy = Happy, Not so worried Mamma.